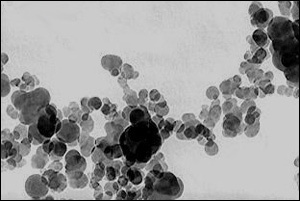 Soot particles may appear as individual spherical particles or as grape-like conglomerates. The diameter of the individual particles generally varies between 10 nm to 70 nm. Considering the size and the specific morphology of these particulates, the analysis for identification is best performed by electron microscopy ensuring the appropriate magnification range for imaging. The use of electron microscopy is due to the fact that even the best light microscopes can only achieve 1000x magnification. At a magnification of 1000x, observations are limited to particles no smaller than 300nm. Black carbon particles are generally at least one order of magnitude smaller. Therefore, in order to resolve the submicron size and the aciniform morphology of particles of black carbon/soot and carbon black, the resolution power of Transmission Electron Microscopy (TEM) is needed. In fact, ASTM D6602 designates TEM as the mandatory evaluation technique. This is technique used at EMSL Analytical. The majority of nano-size particles, such as iron oxides/rust, titanium dioxide or aluminum oxide, have the same morphology. For example, titanium dioxide (TiO2) is a common interference due to its spherical morphology and its expansive use in paints, food, commercial and pharmaceutical products. 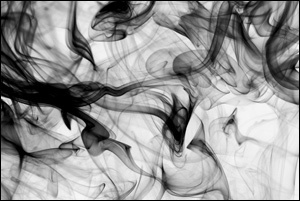 Therefore, the particles elemental composition should also be determined by Energy Dispersive X-Ray Analysis (TEM/EDX) to verify if the material sampled is actually black carbon as is performed at EMSL Analytical. 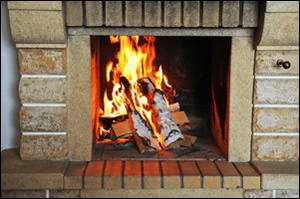 Identifying the origin of combustion products formation can also help to eliminate potential sources. At EMSL, this is performed using Transmission Electron Microscopy in conjunction with Gas Chromatography/Mass Spectrometry (GC/MS). The analysis is based upon size characterization (TEM) and the presence of selected functional groups in the samples that distinguish sources such as paraffin residue from candles or fuel oil from oil heaters (GC-MS).